The Blackmagic eGPU brings more horsepower to MacBook Pro users. Blackmagic Design today announced the Blackmagic eGPU, a high performance graphics processor for pro creative software such as DaVinci Resolve, 3D games and VR. The eGPU was designed in collaboration with Apple and includes a built-in Radeon Pro 850. The eGPU makes an ideal partner to the newly updated MacBookPro laptops, now supporting up to 32GB of RAM on the 15in model..
Apple updates the MacBook Pro line-up with more power for creative professionals. Designed to address the needs of professional video editors, Hollywood colorists and visual effects artists who need to remain mobile, but want the power of a desktop class GPU added to their MacBook Pro, the Blackmagic eGPU is incredibly flexible and simply plugs in via Thunderbolt 3, so users can benefit from improved graphics performance and acceleration of computational tasks. It’s perfect for speeding up professional creative application workflows including editing, color correction and visual effects with DaVinci Resolve. The Blackmagic eGPU adds the performance customers need to make the latest 3D games and VR look more realistic than ever. That means customers will get higher resolution images, higher frame rate gameplay, better lighting and more detailed textures for truly immersive experiences, even on a laptop computer. Featuring an elegant, textured finish design, Blackmagic eGPU is extruded from a single piece of aluminum and features a unique thermal cooling system that’s been designed to perfectly balance the airflow and dissipate heat more efficiently. The cooling system also enables extremely quiet operation as low as 18dB, vital for those working in video production and audio engineering environments. The Blackmagic eGPU features a Radeon Pro 580 graphics processor that delivers stunning graphics and incredible computational performance. You get 8GB of GDDR5 RAM, 256-bit memory bandwidth and 36 discreet compute units for up to 5.5 teraflops of processing power. The Radeon Pro 580 can fill a massive 38.4 billion textured pixels per second! In addition, the Blackmagic eGPU supports Metal graphics technology from Apple, which provides near-direct access to the GPU for maximizing graphics and compute performance with games and applications. 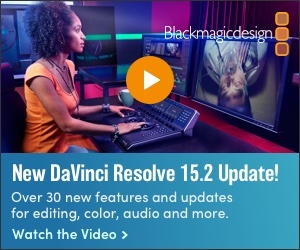 Customers running DaVinci Resolve 15 can expect increased performance for editing with more real time effects, color corrections with more nodes and spectacular ResolveFX such as film grain, light rays, blurs and more. DaVinci Resolve 15 also fully supports multiple GPUs, as well as Metal, so it’s the best way to get the full benefit of the Blackmagic eGPU. The Blackmagic eGPU features two 40Gb/sThunderbolt 3 ports, HDMI 2.0, 85W of charging power, four USB 3.1 connections and HDMI which supports 4K output. It comes in an integrated design that brings high-end desktop class graphics processing to MacBook Pro for professional video workflows, 3D games and immersive VR. And, the Blackmagic eGPU is the first to support Thunderbolt 3 displays. When it comes to power, the Blackmagic eGPU has a built-in power supply that powers the GPU while also providing 85W of downstream power via Thunderbolt 3 for charging laptop computers and powering peripherals. The power supply works from 100V to 240V and features a standard IEC power connector so it can be used anywhere in the world. The new MacBook Pros have a True Tone display with 500 nits of brightness and support for the P3 wide color gamut, and up to 4TB SSD storage on the 15" model. Coincident with the release of the eGPU Apple has announced new MacBook Pro models with 8th-generation Intel Core processors, with 6-core on the 15-inch model for up to 70 percent faster performance and quad-core on the 13-inch model for up to two times faster performance — ideal for manipulating large data sets, performing complex simulations, creating multi-track audio projects or doing advanced image processing or film editing. Additional updates include support for up to 32GB of memory, a Touch Bar, a True Tone display (With 500 nits of brightness and support for the P3 wide color gamut) and an improved third-generation keyboard for quieter typing. And with its powerful Radeon Pro graphics, large Force Touch trackpad, revolutionary Touch Bar and Touch ID, dynamic stereo speakers, quiet Apple-designed cooling system and Thunderbolt 3 for data transfer, charging and connecting up to two 5K displays or four external GPUs, it’s the ultimate pro notebook. Since MacOS 10.3.4, Apple has supported the use of an external Thunderbolt-connected eGPU to accelerate professional applications running on the MacBookPro equipped withThunderbolt 3 connections. The coming together of IT and broadcast brings with it a blurred and chaotic interface. As engineers dig deeper into the differences, it becomes apparent that there still is an important role for dedicated hardware. The UK-based facility FrameTrunk has added high-density AJA Corvid 88 video and audio I/O cards to help manage multiple, high resolution input and output streams. Why RAW? What’s the Deal?